LOS ANGELES, CA— Twenty-one local unions from the Coalition of Kaiser Permanente Unions (CKPU) have decided to leave and create a new alliance in the spirit of the original coalition and labor-management partnership. The unions of the new alliance share a deep commitment to each other and continuing partnership with Kaiser Permanente to improve patient care and make Kaiser the best place to work. “After careful consideration and many attempts to work out our differences, it became apparent that the only way to continue working as part of the historic Labor-Management Partnership was to form a new alliance of unions,” said Denise Duncan, RN, President of UNAC/UHCP (affiliated with AFSCME) in Southern California. The internal decision-making process of the original coalition had historically been based on consensus, to balance the needs and concerns of all its constituent unions—which varied in size from dozens to tens of thousands of members—without any one union dominating. By this process, the coalition had successfully negotiated five national contract agreements with Kaiser. In recent months, during the lead-up to bargaining a new national agreement, the tactics of SEIU-UHW in Southern California had flown in the face of this longstanding tradition of broad-based consensus. The new alliance, not yet named, will include 21 locals of AFSCME, UFCW, USW, IBT, KPNAA, IUOE, OFNHP (AFT), and ILWU. Together these unions represent over 45,000 members across hundreds of job classifications in nearly every geographic area where Kaiser Permanente has a presence. The trailblazing Labor-Management Partnership (LMP) between Kaiser Permanente and the original coalition of unions was born as a response to financial difficulties faced by Kaiser during the 1990s. It drove innovation that improved the quality of health care, reflected in rising quality ratings for KP and increased affordability for patients. It’s the largest, longest-running and most comprehensive labor-management partnership in the United States, well-studied within academia while its innovations in integrated health care delivery have been widely adopted throughout the entire United States’ health care system. 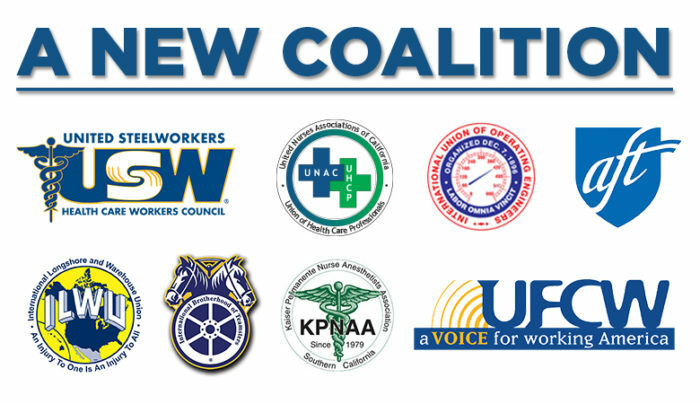 The new coalition will comprise the following unions: UNAC/UHCP and HGEA (AFSCME), UFCW Locals 1167, 135, 1428, 1442, 324 and 770 in Southern California, UFCW Locals 27 and 400 in Mid-Atlantic, UFCW Local 7 in Colorado, UFCW Local 555 in Northwest, UFCW Local 1996 in Georgia, UFCW Local 21 in Washington, USW Local 7600, IBT Local 166, KPNAA, IUOE Local 501 and Local 1, OFNHP (AFT Local 5017), and ILWU Local 28.